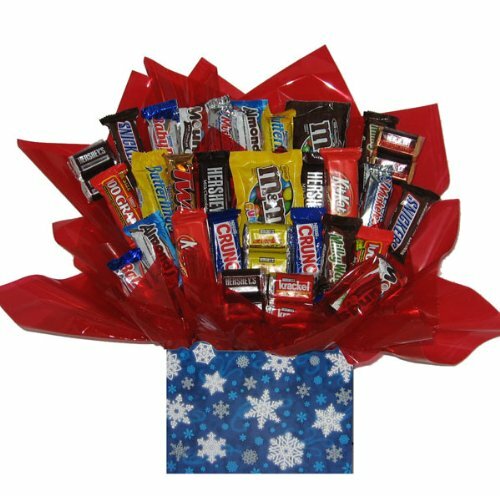 Take the stress out of gift giving with this custom-made to order chocolate candy bouquet. Versatile for any occasion. 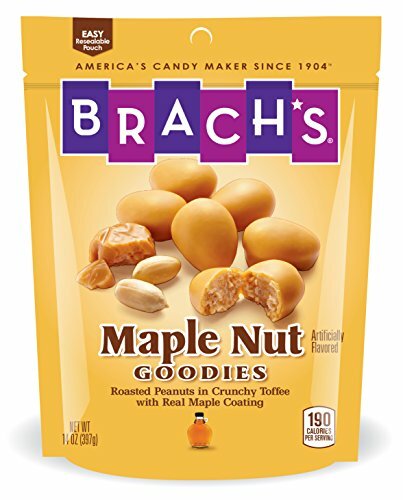 Loaded with the best selling fun sized candies from Hershey, Mars & Nestle. Our chocolate is stored at 60 to 70 degree's Fahrenheit and is never frozen. We take great pride in ensuring that your recipient receives a memorable gift and not a melted chocolate mess. Your order ships with a re-usable gel pack, shrink wrapped and tied with a bow for a worry free gift giving experience. Fun and unique gift for anyone on your list! Each basket is custom made with attention to detail, shrink wrapped, tied with a bow for presentation, and ready for gift giving. Include a personalized message with your order by marking GIFT during check out. 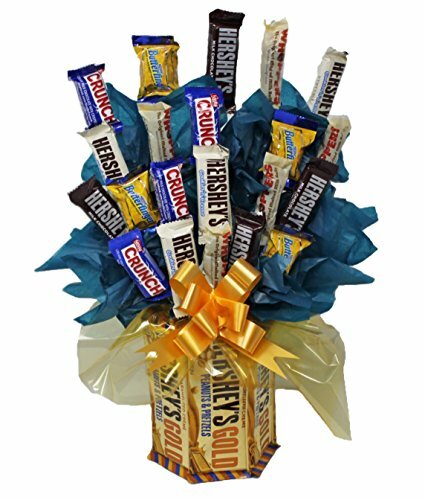 Send the gift of sweets with this delicious candy bouquet! 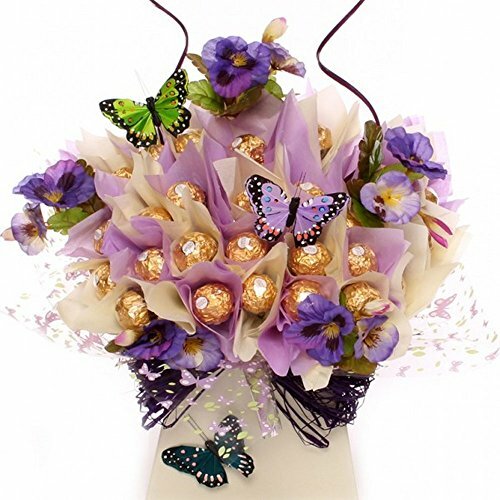 Any man, woman or child would be delighted to receive this beautiful gift on Mother's day, Father's day, Graduation, Birthday or any other special occasion for that matter. Round, decorative box can be re-purposed for home or office use once all the goodies are gone! A truly delightful gift for teachers, neighbors, friends, family, coworkers, bosses, or clients. 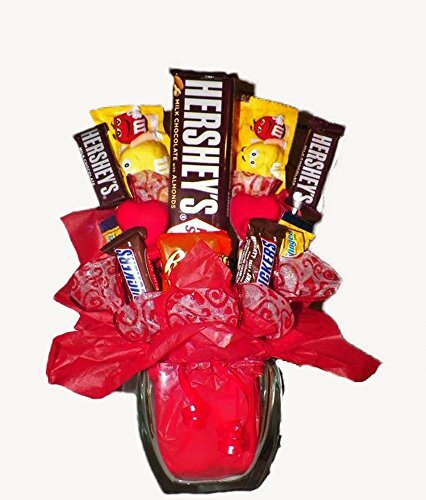 Tell that special someone you appreciate them with this thoughtful candy gift bouquet. Lavender Sweetheart Chocolate Roses made using finest premium milk chocolate highly molded, three dimensional, with rose petals imprinted chocolate. 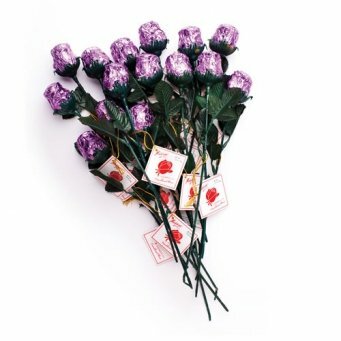 Each rose contains 1/2 Oz solid milk chocolate, foil wrapped light purple foils, sitting atop 9 1/2 inch stem. Chocolate Roses elegantly arranged in bouquet, wrapped florist paper, inserted within floral sleeve, complete with bow. Perfect gift for someone you know or love that loves candy this is a unique and tasty gift that is sure to make their day. 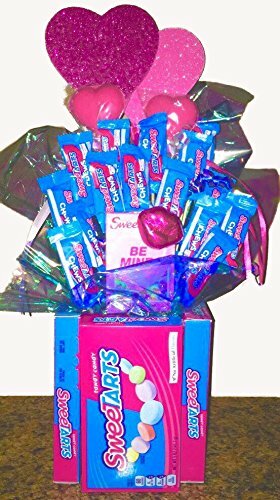 Made with sweettarts, sixteen fun sized sweet tarts, and two pink lollipop treats and a base made out of sweet tarts. Send your wishes with this clever gift basket delivered right to their doorstep. 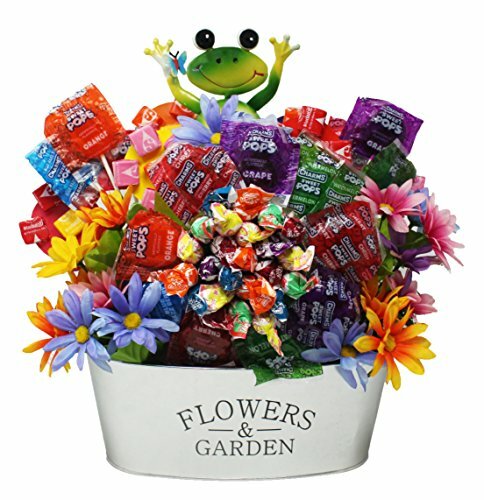 Whatever the celebration, we know this candy bouquet will cause a great big smile. Send your best wishes with the best of good taste! Holiday Christmas box makes an excellent gift and is filled with delicious pieces of fun size and bite size candy bars. Fun Size candies may include multiple pieces including 3 Musketeers, Almond Joys, Butterfingers, Snickers, Baby Ruths, M&Ms, Nestle Crunchs, Mounds, Milky Ways, 100 Grands, Twixs and Kit Kats candy bars. We may substitute comparable candies if necessary. 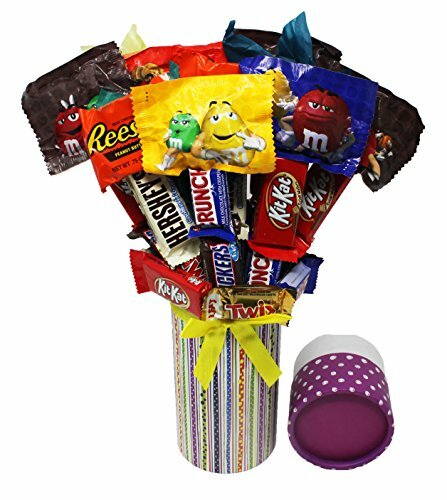 Candy Bouquet measures approximately 15in wide by 6in deep by 17in tall.